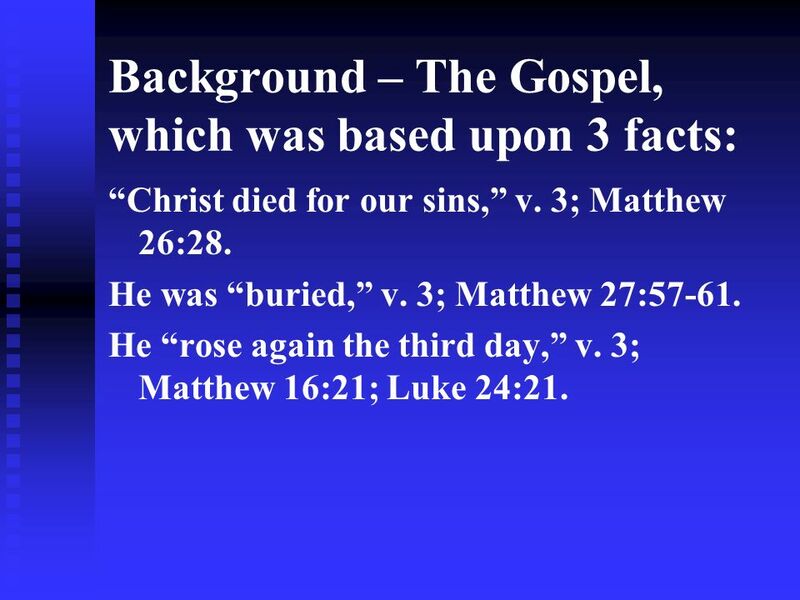 2 Background – The Gospel, which was based upon 3 facts: Christ died for our sins, v. 3; Matthew 26:28. He was buried, v. 3; Matthew 27:57-61. He rose again the third day, v. 3; Matthew 16:21; Luke 24:21. 3 Proof of the Resurrection, 15:5- 11. 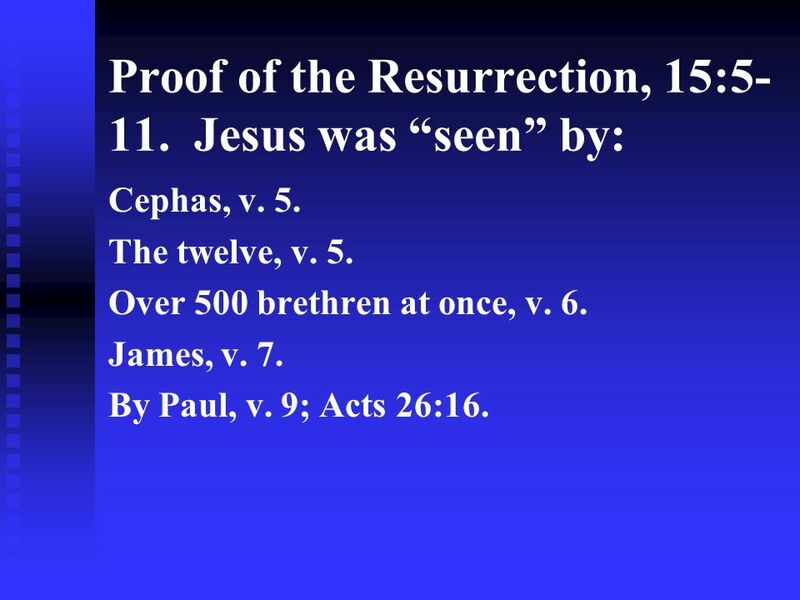 Jesus was seen by: Cephas, v. 5. The twelve, v. 5. Over 500 brethren at once, v. 6. James, v. 7. By Paul, v. 9; Acts 26:16. 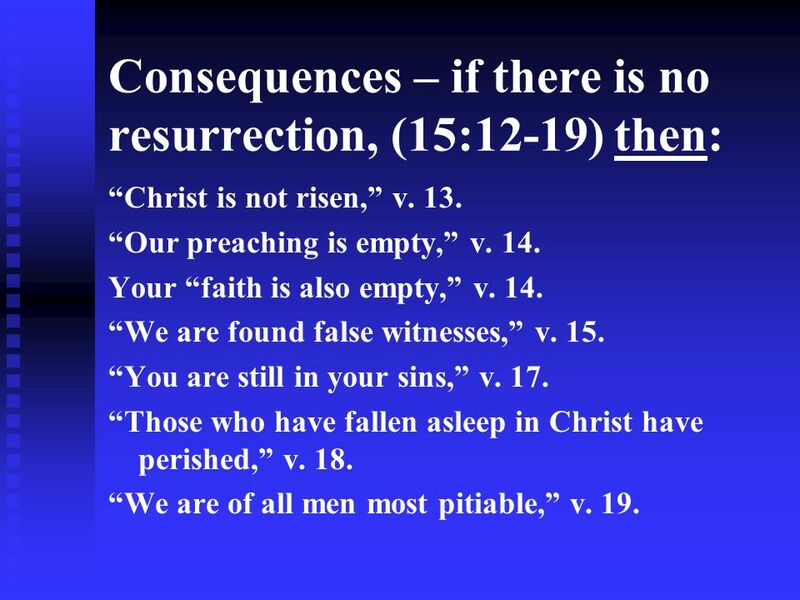 4 Consequences – if there is no resurrection, (15:12-19) then: Christ is not risen, v. 13. Our preaching is empty, v. 14. Your faith is also empty, v. 14. We are found false witnesses, v. 15. You are still in your sins, v. 17. Those who have fallen asleep in Christ have perished, v. 18. We are of all men most pitiable, v. 19. 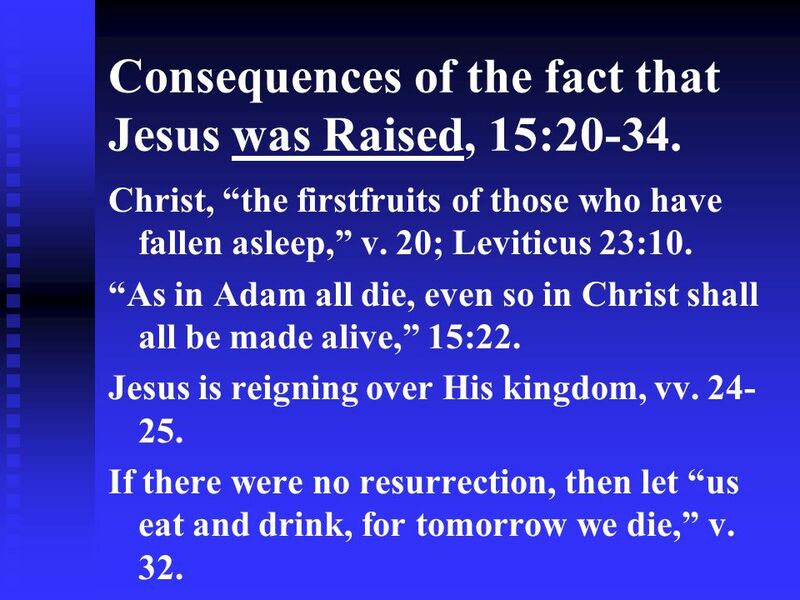 5 Consequences of the fact that Jesus was Raised, 15:20-34. Christ, the firstfruits of those who have fallen asleep, v. 20; Leviticus 23:10. As in Adam all die, even so in Christ shall all be made alive, 15:22. Jesus is reigning over His kingdom, vv. 24- 25. If there were no resurrection, then let us eat and drink, for tomorrow we die, v. 32. 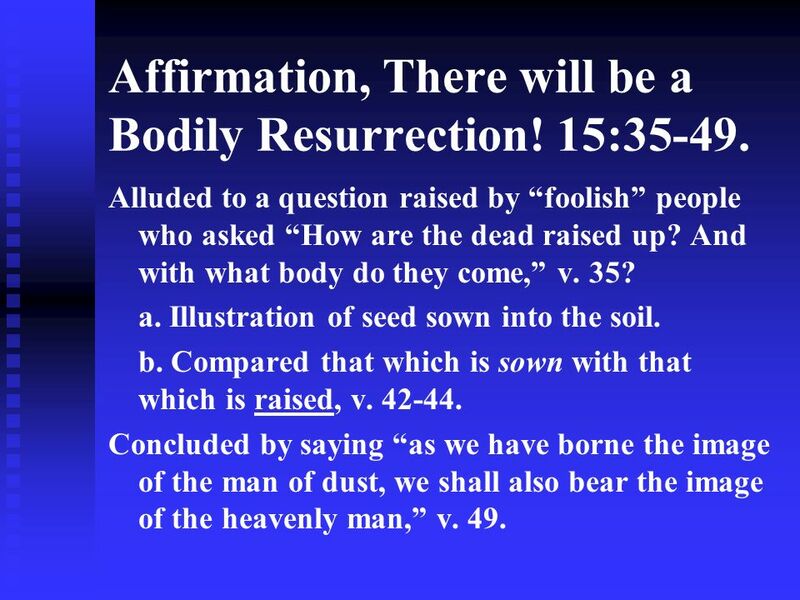 6 Affirmation, There will be a Bodily Resurrection! 15:35-49. Alluded to a question raised by foolish people who asked How are the dead raised up? And with what body do they come, v. 35? a. Illustration of seed sown into the soil. b. Compared that which is sown with that which is raised, v. 42-44. Concluded by saying as we have borne the image of the man of dust, we shall also bear the image of the heavenly man, v. 49. 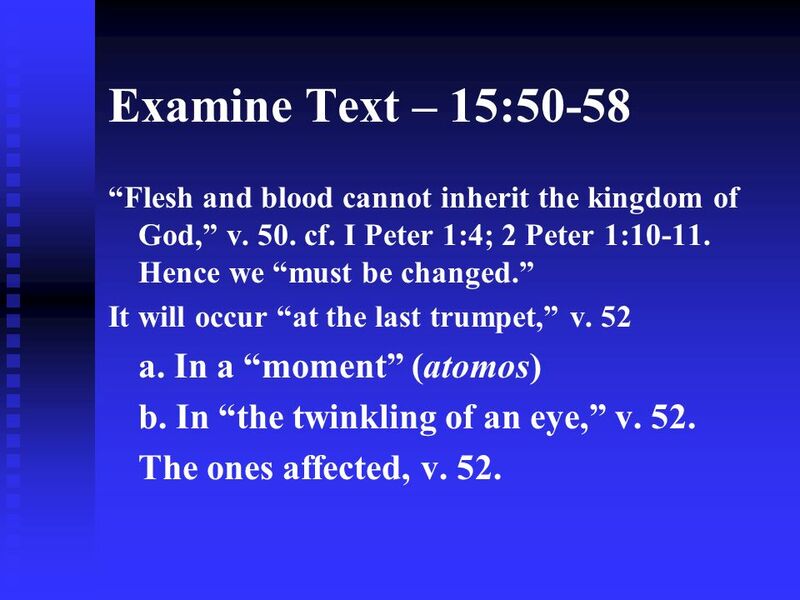 7 Examine Text – 15:50-58 Flesh and blood cannot inherit the kingdom of God, v. 50. cf. I Peter 1:4; 2 Peter 1:10-11. Hence we must be changed. It will occur at the last trumpet, v. 52 a. In a moment (atomos) b. In the twinkling of an eye, v. 52. The ones affected, v. 52. 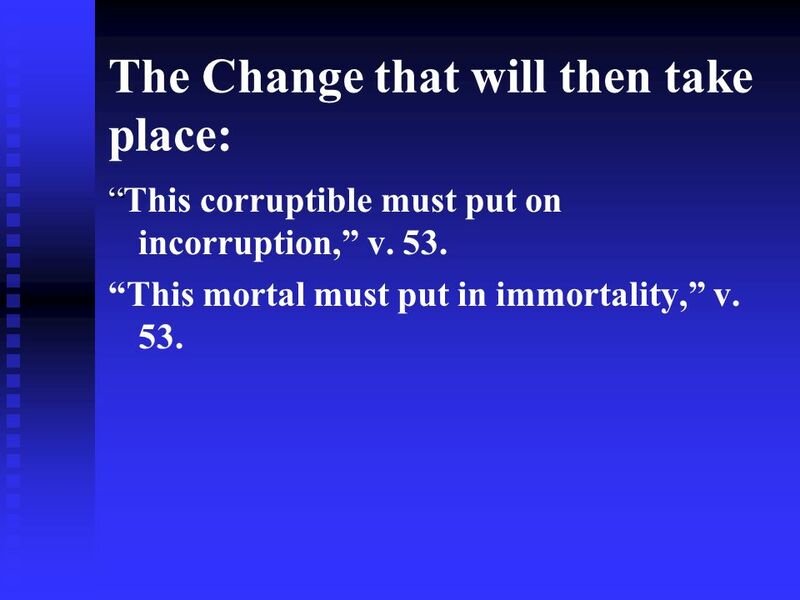 8 The Change that will then take place: This corruptible must put on incorruption, v. 53. This mortal must put in immortality, v. 53. 9 When this happens: Then shall be brought to pass the saying that is written, Death is swallowed up in victory, v. 54. cf. Isaiah 25:8. 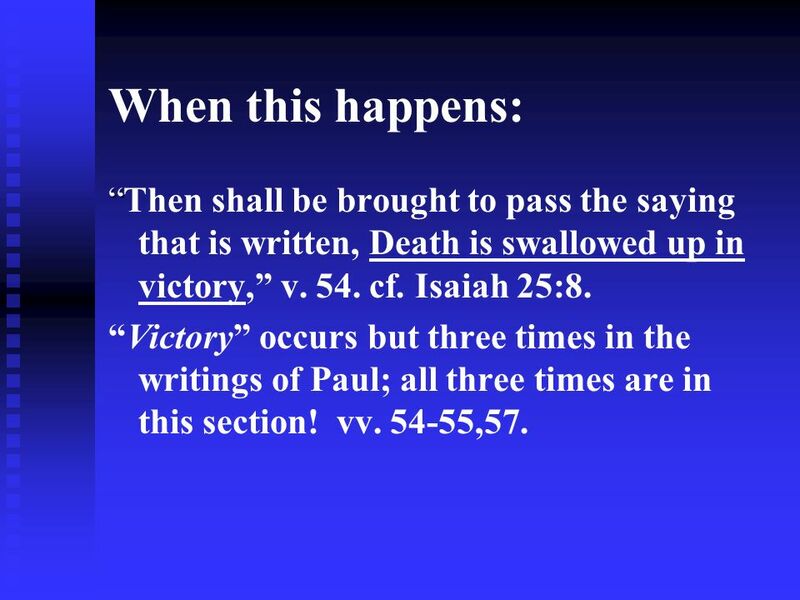 Victory occurs but three times in the writings of Paul; all three times are in this section! vv. 54-55,57. 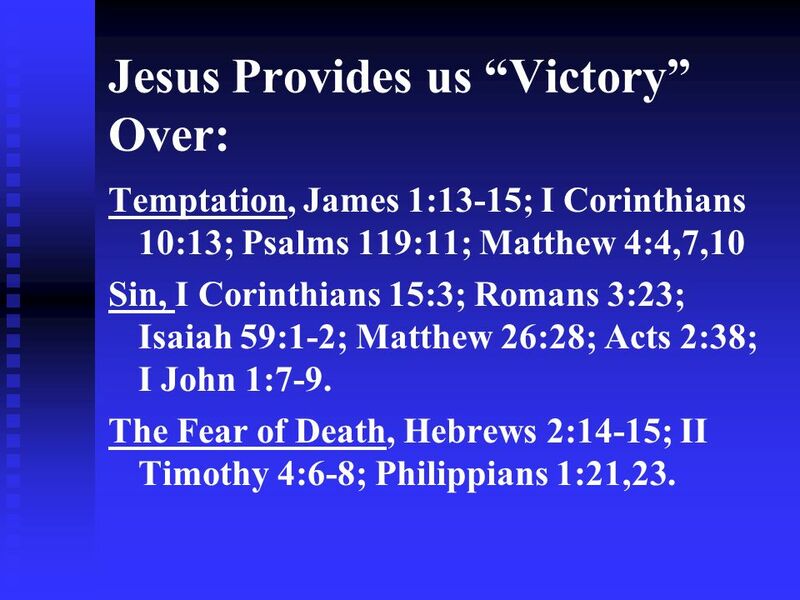 10 Jesus Provides us Victory Over: Temptation, James 1:13-15; I Corinthians 10:13; Psalms 119:11; Matthew 4:4,7,10 Sin, I Corinthians 15:3; Romans 3:23; Isaiah 59:1-2; Matthew 26:28; Acts 2:38; I John 1:7-9. The Fear of Death, Hebrews 2:14-15; II Timothy 4:6-8; Philippians 1:21,23. 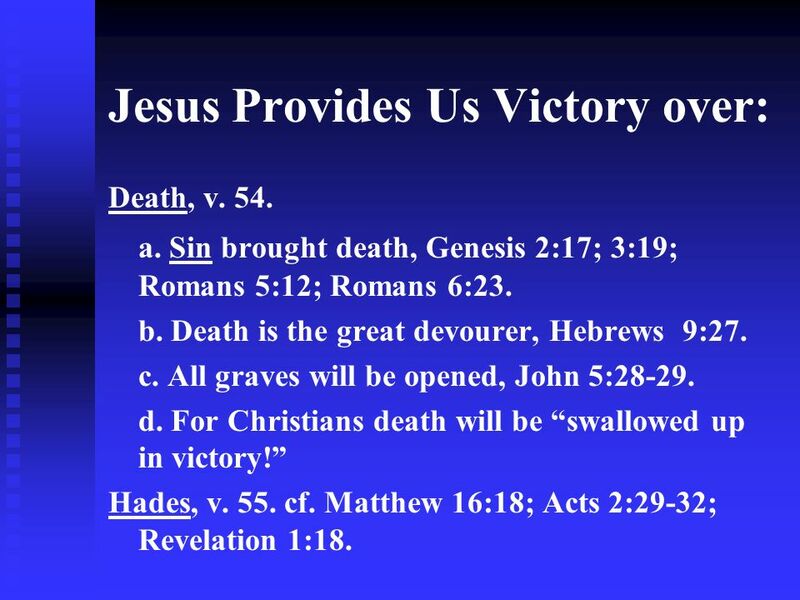 11 Jesus Provides Us Victory over: Death, v. 54. a. Sin brought death, Genesis 2:17; 3:19; Romans 5:12; Romans 6:23. b. Death is the great devourer, Hebrews 9:27. c. All graves will be opened, John 5:28-29. d. For Christians death will be swallowed up in victory! Hades, v. 55. cf. Matthew 16:18; Acts 2:29-32; Revelation 1:18. 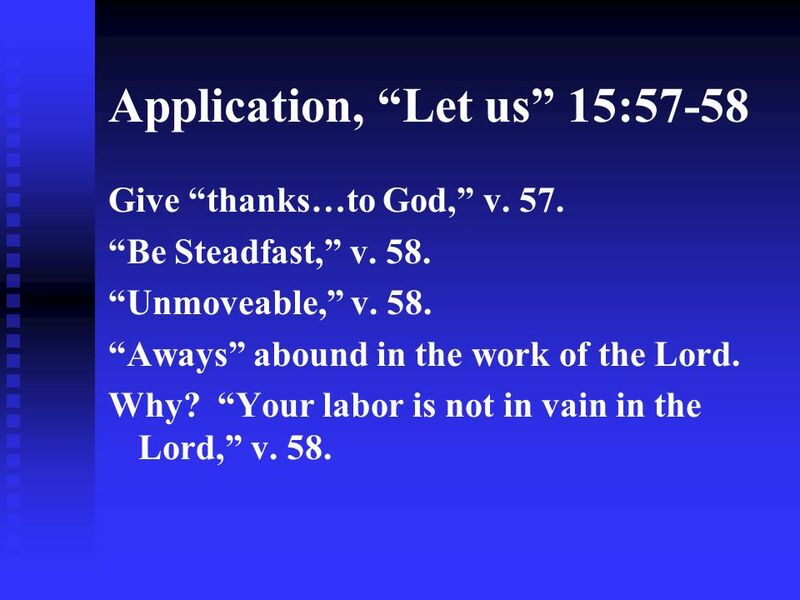 12 Application, Let us 15:57-58 Give thanks…to God, v. 57. Be Steadfast, v. 58. Unmoveable, v. 58. Aways abound in the work of the Lord. Why? Your labor is not in vain in the Lord, v. 58. 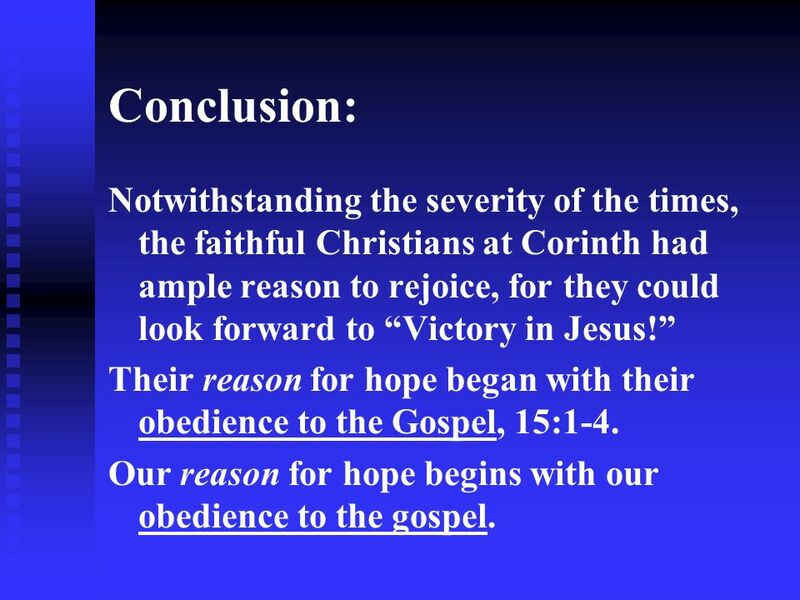 13 Conclusion: Notwithstanding the severity of the times, the faithful Christians at Corinth had ample reason to rejoice, for they could look forward to Victory in Jesus! Their reason for hope began with their obedience to the Gospel, 15:1-4. Our reason for hope begins with our obedience to the gospel. 14 What Must I do to be Saved? Hear the gospel, Romans 10:17. Believe the Gospel, Mark 16:15-16. Repent of sins, Acts 2:38. Confess faith in Jesus, Acts 8:37. 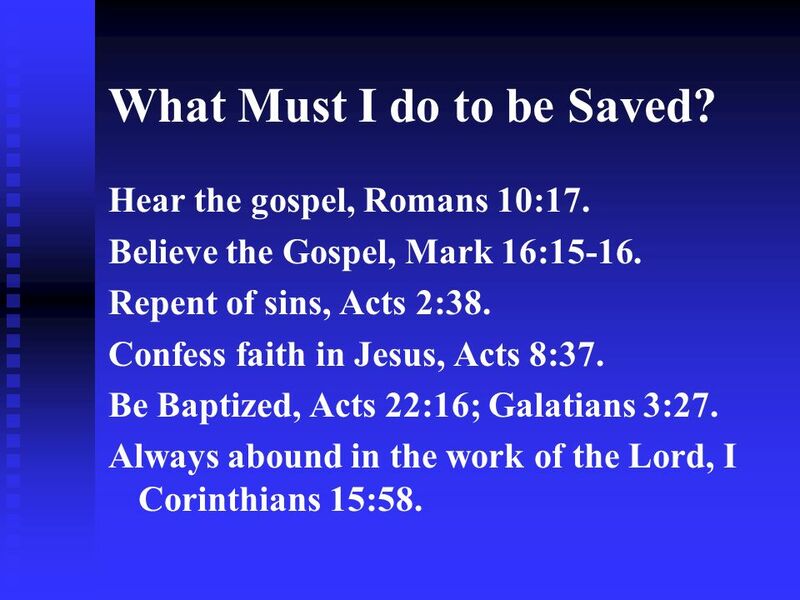 Be Baptized, Acts 22:16; Galatians 3:27. Always abound in the work of the Lord, I Corinthians 15:58. 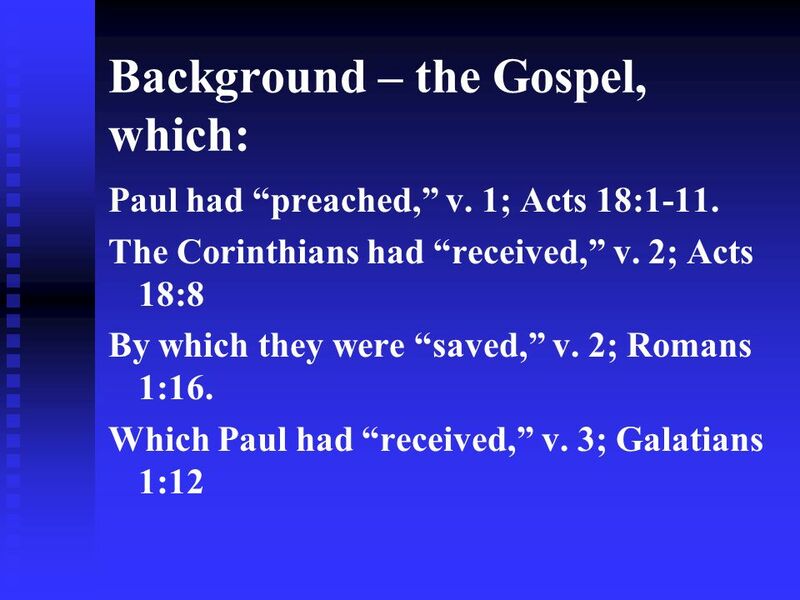 Download ppt "Background – the Gospel, which: Paul had preached, v. 1; Acts 18:1-11. The Corinthians had received, v. 2; Acts 18:8 By which they were saved, v. 2; Romans." What Happens to Us When We Die? 1. What is the teaching of the Rich man and Lazarus? Notice why Jesus was using this story. 2. 1 Corinthians 15:58 …knowing that your toil is not in vain in the Lord. 1 Corinthians 13. Two weeks ago: the vast evidence… Last week: the ugly alternatives… If the dead are not raised, LET US EAT AND DRINK, FOR TOMORROW WE.